I'm just going to preface this review by saying if you only get one lip item this season, make it the Le Métier de Beauté Aurora Kaleidoscope Lip Kit. It contains all that is good and fun about this spring (or any spring. After all, how often has spring collections strayed from pink?) and inspire such happiness in me. 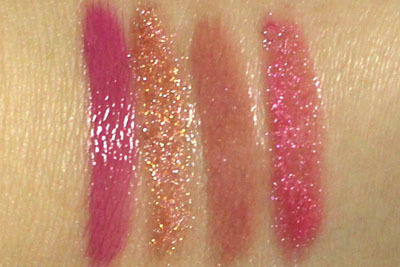 I dare say I like this even more than the eye kaleidoscope (which I've seen but unfortunately was not able to swatch. We'll just have to wait till mid-March for that). 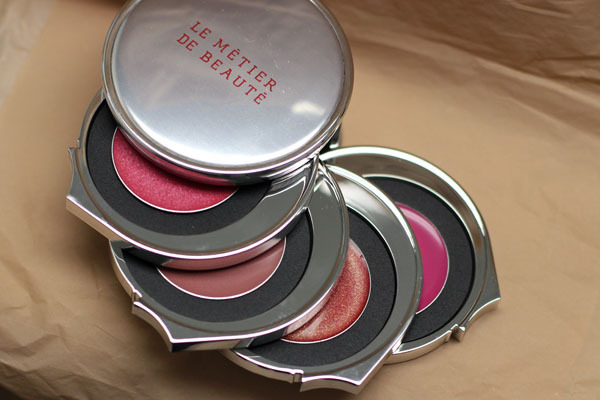 When applying, keep in mind that Le Métier de Beauté lip kaleidoscopes work the other way around compared to the eye kits. You layer the lip colors from bottom to top instead. The pictures below show how the colors change layer upon layer. 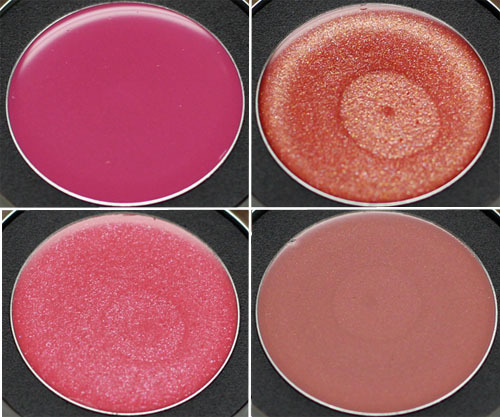 The lip kits always come in a range of finishes. The third and fourth shade are usually more pigmented compared to the upper two, presumably because the latter are meant for adding depth. My love for the lip crème formula is well documented on Messy Wands. Without a doubt, it is the most comfortable lip product that has ever sat on my lips. It contains a faint vanilla scent, is non-sticky, and four layers of gloss later my lips still feel light as air. 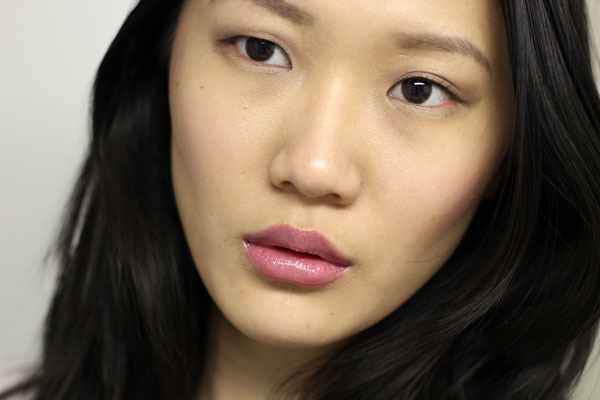 I don't believe in perfection, but the lip cremes come pretty darn close. Le Métier de Beauté Aurora Kaleidoscope Lip Kit is priced at the usual $95 and will be available mid-March. From what I hear, several counters have already started taking pre-orders for the entire Northern Lights collection. I have my eye kit and nail polishes all booked up, and I suggest you do the same. As ever, if you don't have a Le Métier de Beauté counter near you, you can always reach the super helpful Dustin Lujan at 212-872-8612. Tell him I sent you and he'll be extra nice, I promise! This product was provided to me for consideration by the company. Oh my gosh that looks so WONDERFUL on you! I am officially going to be broke this Spring. Lovely review. I have to ask, what do you have on your cheeks? I have yet to try one of these-oh do I ever need to try this one! Gorgeous on you! urghhh I'm never ever tempted by lip palettes, but somehow this looks like the best thing ever + pure magical goodness rolled into one. And with any other product, I would go pfft layering? Gimmicky. But this looks amazing on you! It's now on my mental lemmings list, even above the Eye Kaleidoscopes. Yep, I'm going to have to make this my first lip kaleidoscope purchase. These are beautiful! I am going to have to look into getting this. Your lips look perfect in each shade! I'm tellin ya, you give Liu Wen a run for her money! YOU should be a Lauder girl! Tracy- Please record a Tracy/Rae Flail for us! And yes, yes you do. Leigh- You won't regret it! 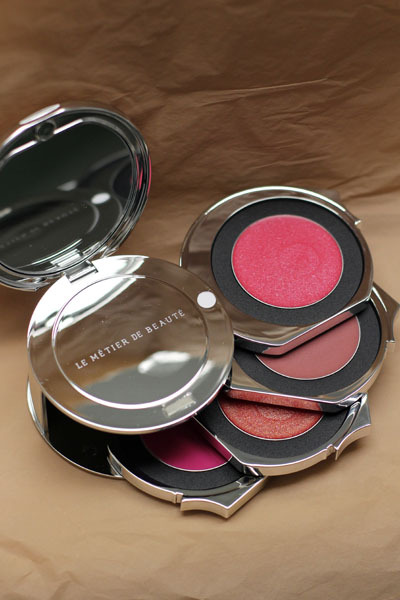 I've never tried any Le metier product before because they're not available here in germany. but I can see that it's a nice lip product there! thank you for the review! wow, the product photographs wonderfully. fortunately (for my wallet's sake) the resulting color doesn't look all that unique or stunning to justify $95. hopefully, i will have the same luck with the eye kaleidoscope, which some say look very similar to le cirque. That looks amazing! Perfect for spring and perfect on you! Jade in the Palace- I wish Le Metier was more widely available worldwide! People need to have access to them :( Thank you for that huge compliment! mile.epatant- I don't like potted glosses as well, but I think these colors are worth it! Pammy- It's a great kit for sure! liz- hahaha, though sigh I know what you mean. For editorial purposes most times I purchase it anyway, though. PerilouslyPale- Thank you, C. Long time no talk!